With the World Cup football tournament beginning in 17 days, themed phishing websites, email scams and football-related spam is growing by the day, researchers at Kaspersky Lab say. 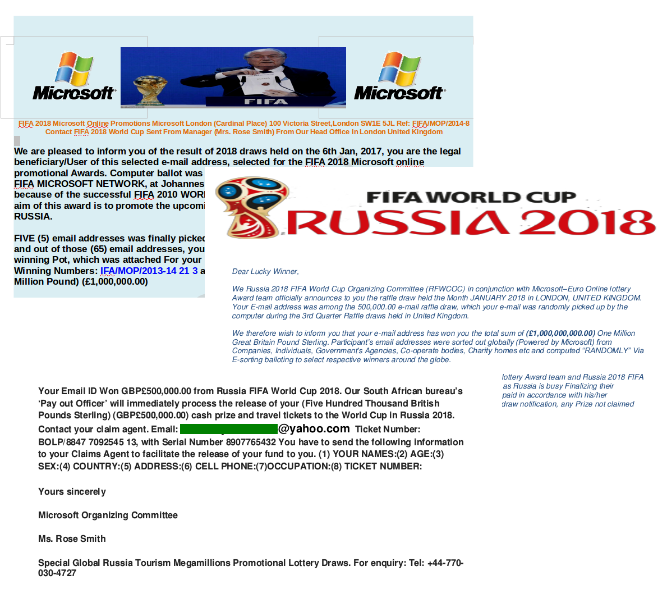 Among the many scams that researchers Maria Vergelis and Andrew Kostin found were fake notifications about winning lotteries claimed to have been held by World Cup sponsors, fake ticket giveaways, spam that advertised related goods, ticket sales, fake sites and messages from official partners and other assorted frauds. Among the fake lottery notices, some came with attachments where the "winner" was told to leave personal details in order to receive the "prize". In some cases, they were also asked to make a small payment upfront for handling costs. "Such mailouts are aimed primarily at harvesting user data (including financial), plus picking up a small money transfer. Such messages can also contain malicious attachments," Vergelis and Kostin said. In the case of the fake ticket giveaways, intended victims were asked to either register on a promotion page with an email address or else send personal details. The researchers said this was aimed at update email databases so that the amount of spam sent by these fraudsters could be increased. Examples of messages offering merchandise. Bogus notices with merchandise linked to the World Cup arrived in emails often with the pictures of famous players like Germany's Mesut Ozeil. Some of these emails resembled those that were sent by the official FIFA store. Vergelis and Kostin pointed out that there were spam emails that were unrelated to the Cup, but which used a subject line about the tournament. They came across one sample where the sender had not even bothered to change the subject from "The 2006 World Cup Final?" Tickets were being sold by scalpers, who took advantage of loopholes in FIFA rules, and there were also bogus tickets on offer. "However, official tickets can only be bought on the official FIFA website, and large fines are imposed for their illegal sale or resale," the researchers noted. "Those who use the services of speculators risk being turned away at the stadium: tickets are personalised, and if the bearer fails to show ID matching the information in the ticket, FIFA staff have the right to refuse entry." Examples of fake lottery win notifications. There were also sites that posed as being partners with the tournament, quite often offering ticket giveaways for clients. Plus, there were notifications that asked users to update their FIFA account details. One of the big targets was VISA, a commercial sponsor of the tournament. Here, the scammers sought to steal credit card details through the use of phishing. Finally, there were sites that sought to use the overwhelming worldwide interest in the tournament to plant malware on users' computers. "In some cases, phishers have no interest at all in bank accounts and payment details," Vergelis and Kostin said. "For instance, under the pretext of receiving a World Cup-themed update for the video game FIFA Soccer, users are prompted to enter their account credentials for the Origin platform on a fake login page. "If there are games of interest under the victim’s profile, the cyber criminals change the login/password and link the account to a new email address for subsequent resale." Wrong year, same product: general spam offering Viagra. There were also scams that sought to lure users by offering cut-price airline tickets for those travelling to Russia for the Cup. Use the latest security solutions to protect against cyber threats, and keep the databases up-to-date.